These days, everyone needs a home office to pay the household bills and work on things that you’ve taken home from the office, but that’s no reason for the room to be boring! Here are some home office decorating ideas that will put some zing in your office. No one wants to sit in a boring white room, even if you are in there to pay bills or work so why not put some bold splashes of color in the room to liven it up? Start with the walls and don’t be afraid to use something bright – you can always just paint over it later if you don’t like it! Choose 2 complimentary colors and use one for your major items like floors and walls and the other for accessories like pillows and desk “stuff” such as pencil holders and in baskets. Try to choose other items such as artwork that will pull the two colors together. Have an adventure in your office by giving it a safari theme. You can put in lots of plants – especially the large floor plants and paint the walls a rich golden tan or wallpaper with bamboo wallpaper. Use a dark mahogany desk for a rich look. How about a zebra or tiger striped rug? Be sure to use lamps, wastebasket, pencil holders and wall art that reflects the safari theme. You can find plenty of items that have elephants, giraffes, monkeys and the like on them to complete your look. How About A Tropical Vacation? One of my favorite home office decorating ideas is to give it a tropical theme – that way you can feel like you are on vacation even when you are working. Again, using plants is key to give the room a lush tropical feel. Use bright colors like sky blue or yellow on the walls and have bright tropical fabrics for your guest chairs and pillows. Try putting up palm tree and beach prints or paintings on the walls and keep your desk accessories in tropical colors. Did you always want an office with a view? Well you can have one in your own home by installing a wall mural that has a skyline view of any city you choose. These murals are pretty easy to put up since they come in two or 3 sheets and are just like wallpaper. This will really transform your room and you can sit at your desk and feel like you are in mahogany row on the top floor of a skyscraper! If your walls are boring, why not add an art collection to your office? Here you can put up dozens of paintings or photographs spaced evenly on the walls much like a gallery. It’s a great place to show off your collection and will give you added incentive to go into your home office. 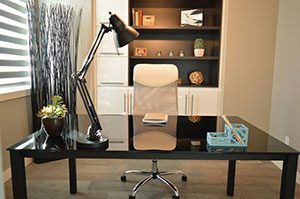 Home office decorating ideas don’t have to be elaborate, just some simple changes can make your home office a more pleasant place to be. I can’t guarantee that you’ll get any more work done, but you’ll sure enjoy the room more! For more home office decorating ideas [http://officedecoratingideasguide.com], visit [http://officedecoratingideasguide.com] where you can get tips on decorating your office in many different styles.